My son has always needed to build. 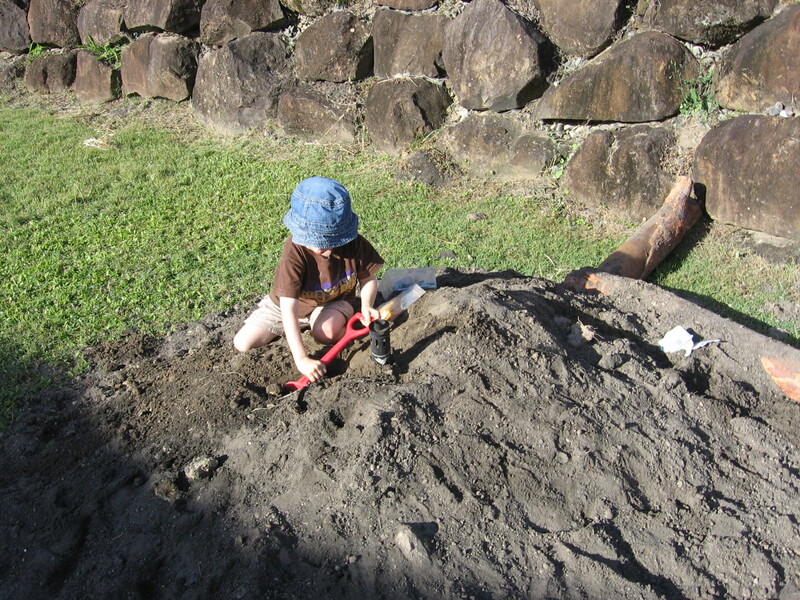 It has been one of the tricky things, living in a rental home, to find a place where he can dig and climb and build in the back yard. To have some independence in his play so that he can safely explore and create without creating too much havoc. In the days that I was offering Family Day Care at home the sand pit was invaluable – for all the children who played at our house, girls included, but for my son it was an absolutely necessary feature. A big pile of soil waiting to go in a garden was a big pile of pure joy. When not digging in the sandpit he’d wander around the place and find all kind of loose parts. Then, seemingly in the period of time it took for me to duck inside and answer the phone, he would have all kinds of bits stacked up on top of each other in sometimes very precarious arrangements, and sometimes with his younger sister inside or on top. I learned to let go and trust. I had to because when I worried about the dangerous arrangements they would happen again anyway. It was actually a great way to learn about safety, balance, strength. It would often take all my self-control to go out there and respect the construction and the experience by quelling my fear and panic and then quietly offering some observations that led to conversations about how to make things safer. The need to build led to the need to tie things down, which led to the need to have play ropes and octopus straps readily at hand. The kids didn’t have many accidents at all – certainly not as many accidents as I had heart tremors each time I looked out the window. And what really amazed me was the sheer strength he needed in order to lift the heavy garden benches, chairs, tables and random pieces of wood he used in all his constructions! One of the best pieces of play equipment we added to the backyard were a collection of plumbing pipes and connecting pieces. This was actually his gift for his fifth birthday. No explanation was necessary … he just went straight outside and began to connect – then he began to experiment by pouring water and sand and small bits and pieces down the pipes, zooming cars through the pipes, working out how to keep them upright, learning what happens when water and sand pool in the bottom. There was so much problem solving involved in this simple gift. The pipes were an awesome addition for outside play, but they didn’t quite cut it as a gift – after spending hours with his pipes he came back in and asked when he could have his birthday present 🙂 All the same we had the pipes in our backyard for a couple of years and they served their purpose. Rocks are great too. Provided they are kept clear of climbing structures (he’s learned that the hard way too). Rocks can be stacked and arranged. They can be markers, walls, designs, weights. Here we found a cache of rocks in a nearby park and couldn’t help ourselves. 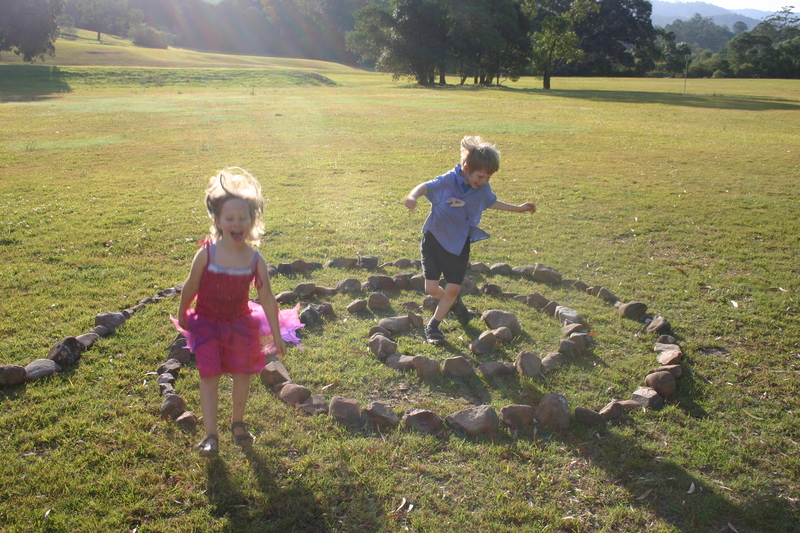 He and I spent a good half an hour shifting rocks to make a double-ended spiral. At home he and his sister have enjoyed finding rocks that they can polish, or crack open, or grind into powder to make paint. I’m a bit wary of the rock-cracking because of the small sharp bits that fly everywhere … but then again both our children have learned through experimenting (and with some adult guidance) how to engage in this play safely. Then of course there are boxes. 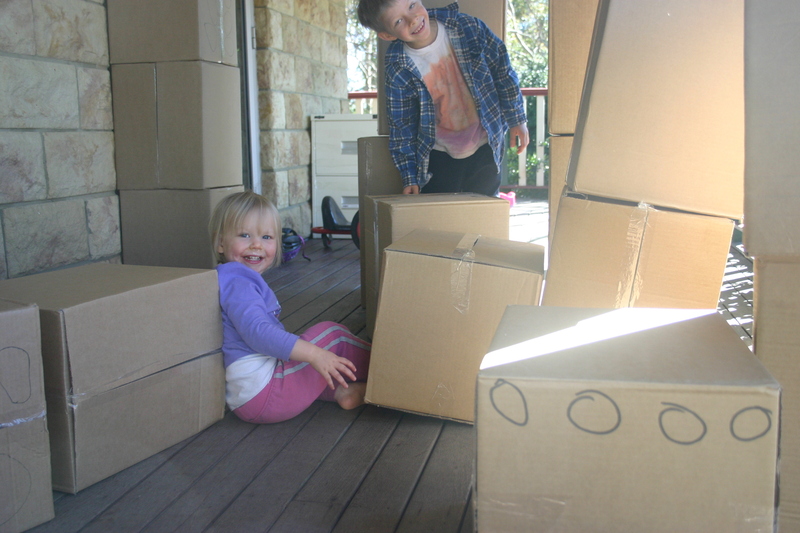 After we moved house I re-taped a few of our boxes together for some large-scale building on the verandah. Everyone enjoyed this, but we had to let the toddler work through her natural instinct to deconstruct stacked blocks before any serious building could begin. 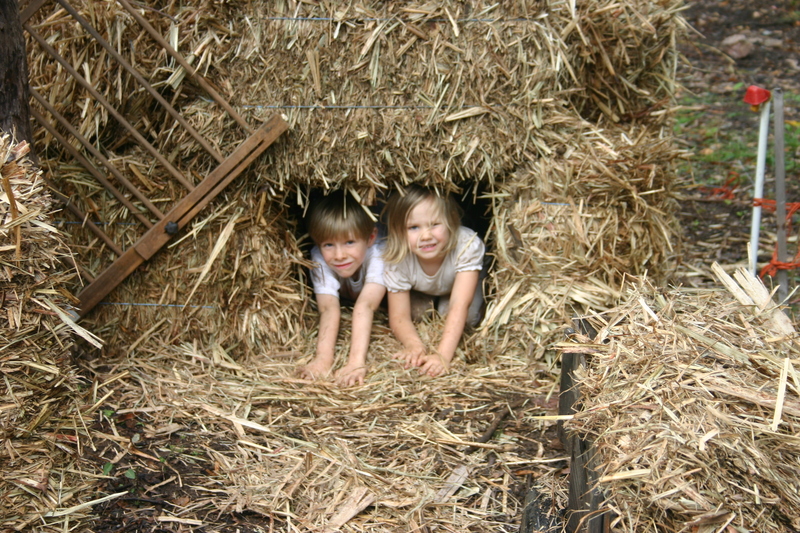 For building that required a more stable construction material there is also straw bales. These were bales of mulch ready and waiting to go on our large garden … but the children found them first and the entire household just had to respect the sheer strength and effort and cooperation it took for the kids to build themselves a fort from those heavy bales. We kept the fort up until the rain dampened them, and with the threat of mould growing on the inside the fort was deconstructed, but that was ok too. The children took almost as much pleasure spreading the mulch everywhere too. 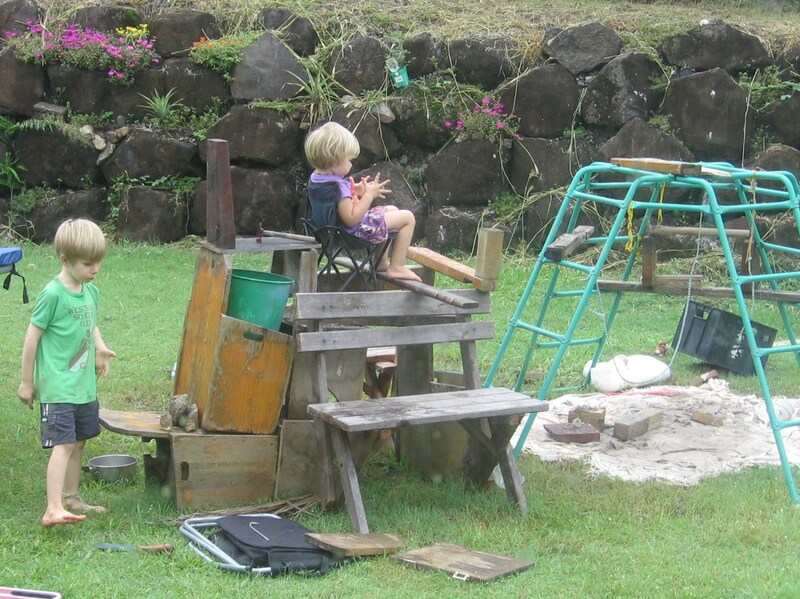 Our backyard has always been full of loose parts and tools. The ‘toys’ we have for outside play include a trolley for carting things around, shovels, rakes, hammers, gardening gloves, ropes and buckets. 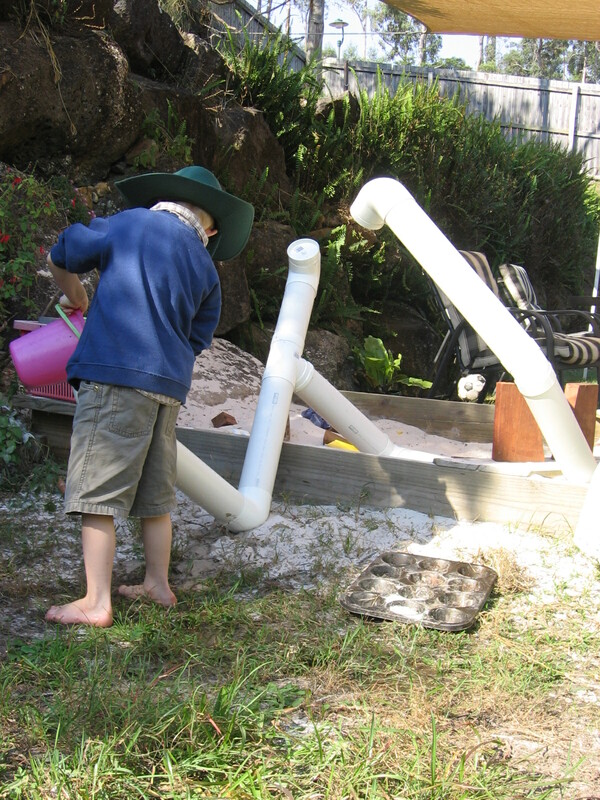 We have a few structured toys in the sandpit (dinosaurs etc) but even still those are ones that facilitate creative play. Loose parts in the backyard means: creativity, strength, cooperation, problem solving, innovation, persistence, resilience, adventure, experimenting. Having unstructured playthings rather than commercial toys in the backyard also means you have children who can play for lengths of time anywhere, with anything. It means you have children who have the chance to show leadership, caring and consideration. It means you have children who are open to fresh ideas and new ways of thinking. It means you have children who can cope well with failure and set about finding another way. I don’t regret the lack of ‘toys’ in our backyard at all. I am glad I found you 🙂 My kids spend a lot of time outdoors! Wow! The things they build are amazing! Thanks so much for linking to the outdoor play party.